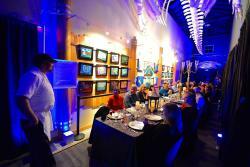 Last Friday, my fiancée and I attended Salty’s “Belly of the Whale” Dinner at the MaST Center Aquarium. The event featured a five-course feast, accompanied by wine pairings, located in the aptly named Belly of the Whale Hall. From what we were told, this event was put on by Salty’s in an effort to show how the venue could be used for future events. Well, if future events even resemble this one, you can count me in. Upon entering the hall, we were greeted by Salty’s employees that took our coats and handed us a couple glasses of Ste. Michelle sparkling rose and some salmon mousse on toasted brioche. We were guided to our seats, where we had a chance to admire our surroundings. The awe-inspiring aquatic aura of the MaST Center perfectly complemented the exquisite, fresh seafood served for dinner. Right above us, hung a 38-foot whale skeleton. 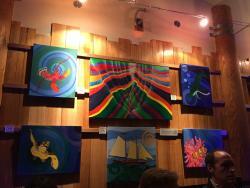 All throughout the walls of the hall, hung beautiful paintings of sea creatures. At the end of the hall, sat a guitarist who played calming tunes throughout the evening. As we took our seats, we introduced ourselves to our neighbors, who happened to be seasoned scuba divers! They told us about their underwater expeditions exploring WWII-era shipwrecks in the Red Sea, encountering angry sea lions in Alaska, and seeing schools of Parrot fish in Bali. Just as we became acquainted with our fellow dinner guests, Chef Josh Green came out and introduced himself. He was a gracious host for the evening and he kept us laughing throughout the night. He also described in detail each course before we were served, which helped to build the anticipation. The first course was an agrodolce trout with marinated peppers and a toasted coriander creme fraiche. I had never had trout before so I had nothing to compare it to. I was surprised that it was a cold dish, and that the marinated peppers made the dish quite sweet. It didn’t take long for me (or the other dinner guests) to finish this course, which transitioned into the second course: warm pancetta salad with crisp romaine lettuce, Roquefort and green onions. This was a deliciously unique salad, that served as a taste of things to come in the following courses. After tasting the pancetta, I couldn’t wait for the next two courses. 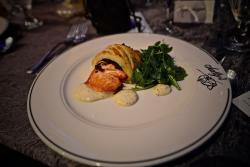 First was the salmon wellington, which was arguably my favorite course of the evening. The salmon was cooked to perfection, and the breading that wrapped around it made the dish that much better. For a five-course meal, the serving size of this course was quite generous, and I couldn’t have been happier. 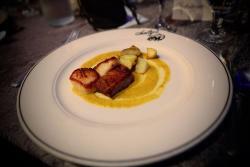 Next we had the crisp pork belly and scallops with a curried cream sauce. This was the course that competed with the Salmon Wellington for my favorite dish of the night. The pork belly was juicy and tender and the scallops were full of flavor. The curried cream sauce complemented both parts of the entrée, and I enjoyed the sweet flavor it added to the scallops. We ended the night with a sweet and scrumptious raspberry sorbet in an almond tuille. The refreshing sorbet capped the night off perfectly, just as Chef Josh Green said it would. As we finished eating, Chef Green thanked us all for a wonderful evening and introduced us to the general managers of Salty’s at Redondo and Salty’s at Alki. We left the dinner feeling full and happy. Salty’s has been a Seattle classic for years and if the purpose of the “Belly of the Whale” Dinner was to showcase what they could do with this unique event space; the experiment was a resounding success. We loved the atmosphere and the décor of the hall; the delicious food was just the cherry on top. My compliments to Chef Josh Green as he created one of the best meals I have had in years. Subscribe to Salty’s newsletter to find out about their next dinner event, so you can try some of the best seafood Seattle has to offer for yourself!